Alumni & Friends Night with Pr..
MTSU joined more than 400 colleges and universities across the nation on Jan. 1, 2012, when it became a tobacco-free campus. The new policy prohibits use of all forms of tobacco products anywhere on campus, including but not limited to cigarettes, pipes, chewing tobacco and snuff, as well as smokeless electronic cigarettes and other similar devices. It does allow use of tobacco products inside private vehicles on campus, however. MTSU has produced two videos about the change, including a brief informational spot featuring Lisa Schrader, director of health promotions for Student Health Services, and several University students and administrators. The second video stars former Blue Raider football quarterback Kelly Holcomb to help convey the message to students, staff and visitors alike that the campus is smoke-free on New Year’s Day 2012. 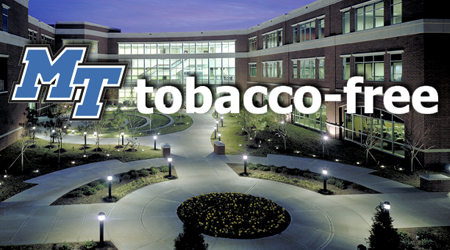 For information about the new policy at a glance, as well as smoking-cessation resources and a note from MTSU President Sidney A. McPhee, visit www.mtsu.edu/tobaccofree/.